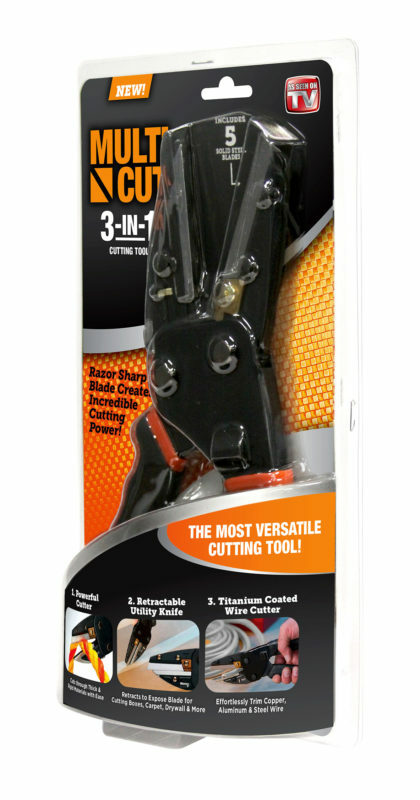 The Multi-Cut® 3-in-1 cutting tool is the most versatile cutting tool that everyone should have! Multi-Cut® combines a powerful cutter great for cutting through rope, wood, leather, rubber; a wire cutter great for cutting copper wire, aluminum steel wire; and a retractable utility knife, ideal for cutting boxes, carpet, and drywall! The razor sharp blade creates incredible cutting power every time! Includes 5 solid steel blades, one assembled and 4 replacement blades that conveniently store in the handle.